As is my custom, I attended the annual Memorial of Jehovah’s Witnesses. The Witnesses celebrate what most Christians refer to as communion only once a year. Things were different for me this year because my wife also attended, but we didn’t go in together. She had an interesting idea that I will explain later. I’ll give a short summary of what usually happens at this ceremony, explain why my wife came with me this time and then I will describe the events of the evening. Since this is the only religious holiday Jehovah’s Witnesses celebrate, attendance at Kingdom Halls for this service is much like Christmas and Easter is for Christians. If you are associated with the Witnesses in any way, and you could only make one meeting all year, this would be the meeting. Parking lots are filled and everyone is wearing their Sunday best. The service starts just after sunset. 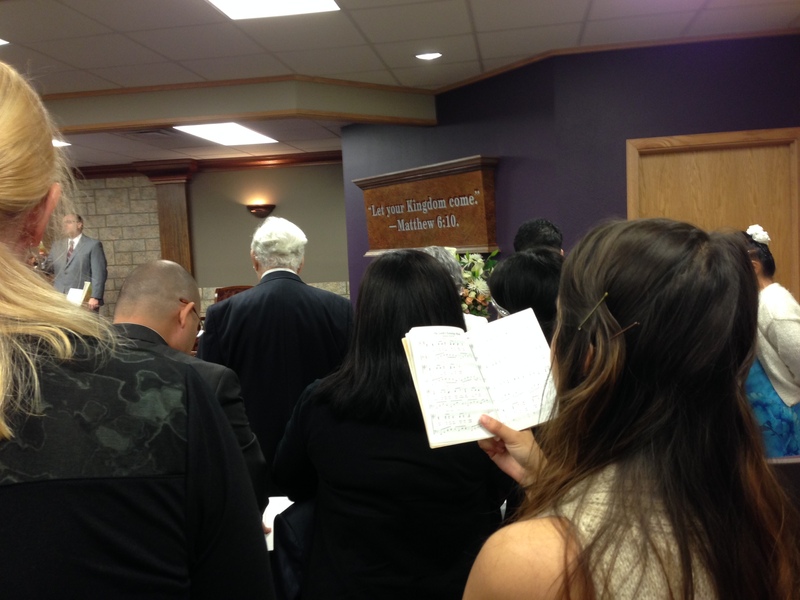 Since there is limited space at Kingdom Halls, sometimes the Witnesses will rent out public halls or hotel conference rooms. They also have a later meeting at 9:00 to accommodate everyone who wants to attend. The meeting begins with an announcement for everyone to begin finding their seats. The building is usually packed so they want to make sure everyone is seated before they begin. A very respected man (an elder or someone of greater authority), will stand up in front of the audience and give a presentation that lasts approximately 45 minutes. Our guy was shorter this year and managed to get through the Watchtower supplied outline in less than 40 minutes. The speaker will jump from verse to verse in the Bible attempting to prove that the only ones who are allowed to partake of the bread and wine are those of the anointed class, numbered at 144,000 members. Since there are very few Jehovah’s Witnesses who claim to be of the anointed (Witnesses are STRONGLY counseled against such claims), yet there are more than 19 million people in attendance at this event world-wide, the average Kingdom Hall does not have anyone who partakes of the emblems. There were 13,204 partakers last year. So basically, someone will get up and speak about how important it is that Jehovah’s Witnesses attend while emphasizing that practically no one will participate. They will then pass the emblems around, watch everyone reject them, then go home. It seems pointless, but Jehovah’s Witnesses look forward to this evening almost like high school students look forward to prom. My wife and I have attended together in the past, but for the last few years we have not always gone together. Becky and an ex-Mormon friend of ours have been meeting with the same two Jehovah’s Witness ladies for more than three years and they have developed quite a unique relationship. One of the Witness ladies has a real kinship with our ex-Mormon friend and sees so much of herself in what our friend went through in Mormonism. Because they had this lively discussion, my wife felt compelled to partake of the emblems when she attended the memorial. It embarrassed the mess out of the two Witness ladies, but she believed she had to make a stand in her belief that she is going to heaven. Every time my wife has attended a memorial since then, she feels like she has to partake because she knows the subject will come up and she needs to stand firm in her convictions. Prior to the meetings with these two Witness ladies, neither my wife nor myself have ever partaken of the emblems. We do not go to cause a scene. We usually do not even go to get a study started with a Witness. Most of the time we go as a reminder of exactly how lost these Jehovah’s Witnesses are. We silently observe Witnesses rejecting the New Covenant and pray, especially for the children. Getting back to this year. I always go and my wife wasn’t sure she wanted to… until I told her that I have heard a rumor that this may be the last time the Memorial is “celebrated.” I don’t want to get into too much detail in this blog post, but if Watchtower doctrine is correct, the number of partakers should be decreasing every year as the anointed remnant die off. The Watchtower does allow for unfaithful anointed to be replaced, but if that happened, then number should remain steady, but never grow, yet since the Watchtower had a doctrinal change in 2007 the number of partakers has increased every year. (For more about this phenomenon, read this excellent article titled, “Increasing Memorial Partakers.”) Since this poses an obvious problem for the Watchtower, they may change doctrine once again and cease the practice altogether. That is what I have been hearing from some sources who are close to the Watchtower. Once my wife decided she was going to attend, she didn’t want to go to the congregation her two Witness ladies attend because there are a couple of elders there who know about me and our ministry. She decided to come with me, but came up with the idea of going in separately. This would give me the opportunity to watch the reactions of those around her when she partakes of the emblems and it would give me a better chance of getting one of the guys to study with me. I seriously doubt that would happen if we sat together and she partook of the bread and wine. Once we arrived at the Kingdom Hall, I dropped my wife off at the front and then went to park the car. One of the parking attendants asked how my “backing up” skills were because they needed some cars to back into their spaces for an easier exit after the meeting. I backed into my space and then wait for 15 minutes before I went into the Kingdom Hall. I watched numerous Jehovah’s Witnesses attempt to back their cars into parking spaces and I didn’t see one of them get it right on the first try. One lady even got out of her car and had the parking attendant do it for her. It reminded me of the Watchtower article that explained the Watchtower’s numerous doctrinal flip-flops as, “Tacking into the Wind.” The December 1, 1981 Watchtower tried to explain on page 26 how their doctrinal reversals are actually stepping forward. It states, “At times explanations given by Jehovah’s visible organization have shown adjustments, seemingly to previous points of view. But this has not actually been the case. This might be compared to what is known in navigational circles as “tacking.” By maneuvering the sails the sailors can cause a ship to go from right to left, back and forth, but all the time making progress toward their destination in spite of contrary winds.” If Jesus can control the wind and the waves (Matthew 8:27), I never understood why Jehovah can’t just sail straight. Evidently his Witnesses can drive straight either. When I walked into the Hall, I saw that it was completely packed. They even had seats set up in the vestibule area back near the literature counter. One of the attendants told me that there were only two seats left so I’d better grab one quickly. I quickly looked for my wife, but did not see her. I didn’t want to sit where I could not see her partake of the emblems so I excused myself and went to the restroom telling the attendant that I would be willing to stand and give my seat to one of the ladies. When I walked out of the restroom, my wife walked out of the ladies room at the exact same time. We quickly ignored each other, but I followed her into the main room to see where she sat. I began looking for a spot on the wall to lean against, but there was nothing available. Last year I gave up my seat for a lady and was able to stand up against the wall and take a picture during one of the prayers. I wanted to be able to do that again, but the way the seating was arranged, there was nothing available. I walked back towards the PA system where I saw a bit of room. I mentioned to one of the guys there that I was looking for a place to stand against a wall. One of the ladies overheard my comment and informed me that she had just received a text from someone who couldn’t come and since they saved a seat for her, I could have her place. This worked out perfectly because I had a decent view of my wife. I think she was so helpful because she knew I was not a Witness. I purposefully wore nice clothes, but did not wear a suit and tie so that I could be identified as a non-Witness in hopes of getting into a conversation after the meeting. I followed her to my seat and we small talked before the meeting started. I brought my iPad to take notes so she asked me if I had internet access, then told me where to see the song book on their web site. I opened three apps to use during the meeting; a Bible app, notes and a browser for the songs. A number of other people came up to me and introduced themselves. They were very friendly and jovial. The service began by singing song number eight (The Lord’s Evening Meal) in their song book. I snapped a picture with my phone during the song. I think the couple next to me noticed. Usually the singing in a Kingdom Hall is horrible. The “Kingdom Melodies” are lame by the standards of any normal Church. There are no instruments, but they do play an instrumental recording of the song and the congregation is supposed to sing on their own with no conductor. This often leads to whiney and out of tune singers starting the song at different times and purposefully singing softly because they know they can’t sing. This was not the case at this Kingdom Hall. Both my wife and I noticed that the singing was much better than any other Kingdom Hall I remember attending. I was pleasantly surprised. Like I mentioned in last year’s blog post, my wife noticed it a number of years ago so now every time I attend a witness function, I always keep track of how many times the word is mentioned. Last year it was mentioned 15 times and this year it was 18 times in less than 45 minutes. The title of the talk was, “Appreciate What Christ Has Done For You.” There is the first mention of the word. After the song someone opened in prayer using the word “appreciate” three times. We were off to a quick start. Since this idea is usually taught during the memorial, I decided to do something I haven’t done in more than a year. I made a Quick Questions For Jehovah’s Witnesses video to ask this question. It will be interesting to see the responses of Jehovah’s Witnesses. The rest of the service was like all the others I have attended. The speaker quickly runs through no less than 20 verses in the short presentation lastly less than 30 minutes. At the rate of one verse every 1 and a half minutes, that is too many verses to be able to effectively keep up with the speaker, read the verses and think about what is being taught. There is ZERO time to look at the context and evaluate the accuracy of what is being said. This is one reason why the Watchtower can get away with things like the above. They can point to certain verses, claim they teach one thing when the context clearly states the opposite. Jehovah’s Witnesses simply do not have the time to check it out for themselves. 1) Why do humans need to be delivered? 2) Who benefit from Jesus’ loving sacrifice? 3) Who properly or scripturally will partake of the bread and wine? 4) What else must we do to show our appreciation and obedience to Jehovah God? The speaker started talking about how Adam once had the prospect of living forever depending on his obedience. We inherited our sin from Adam, but through the sacrifice of Christ we can be ransomed. He then went to John 3:16 and made a distinction between mere belief and exercising faith. He emphasized that we need to do something to be saved. He then spoke about the two hopes, one earthly and the other heavenly. He actually said, “The Bible speaks very clearly that there are two hopes.” The Watchtower teaches that the 144,000 have a heavenly hope while everyone else hope to live forever on a paradise earth. I immediately thought of Ephesians 4:4 which says even in the RNWT, “One body there is, and one spirit, just as you were called to the one hope of your calling.” I do not know why the speaker said there are “clearly” two hopes when the Bible clearly says there is only one. The speaker then began talking about the 144,000 being in heaven and how they know they are chosen to be of the anointed. He kept referring to the “few remaining” who are on the earth are the only ones who have a right to partake of the emblems. No one else does. He read 1 Corinthians 11:26, “For whenever you eat this loaf and drink this cup, you keep proclaiming the death of the Lord, until he comes.” The speaker emphasized the phrase, “Until he comes” and explained that this meant that the Lord’s Evening meal would be observed only as long as there are those of the anointed remaining on the earth. He stated, “Once Jesus arrives in the sense of resurrecting all of the 144,000 and takes them home to be with him in heaven, that is the last time there will be a Lord’s Evening Meal.” This was the same thought brought out last year and is a point that deserves to be challenged. It makes no sense to read the phrase, “until he comes” and interpret that to mean, “until a certain group of people dies off.” First Corinthians 11:26 specifically states that we are to continue to do it until Jesus arrives, not until the anointed remnant leaves. There is a big difference between those two ideas. Think about this from the perspective of the first century Christian. They knew nothing of “the great crowd” doctrine as it wasn’t “revealed” until 1935. Would the 11 faithful apostles who were with Jesus on that night understood His statement to mean they should continue to remember Jesus’ death on Passover until they are all dead and go to heaven thus leaving the Christian congregation to a group of people that will not exist for 19 centuries? Did they really catch that? There is also another implication about this doctrine that I’ve never thought of before I began writing this blog post. If all of the anointed are to die off, what will happen to the Faithful and Discreet Slave? Current Watchtower doctrine teaches that only members of the anointed are allowed to be Governing Body members who serve together as the composite Slave mentioned in Matthew 24:45-47. If this doctrine is true, this would mean that the Faithful and Discreet Slave would have to die before Jesus returns. If this happens, where will Jehovah’s Witnesses get the spiritual food for the proper time? Jehovah’s Witnesses need to think about these questions. In the context of this point, (the anointed dying off) the speaker asked a question which may be one of the reasons for the rumor I heard mentioned above. He asked, “Might this be our last Memorial? Could the new system be so close at hand?” He continued with this line of thought by talking about how this world will soon come to an end. The speaker then read 1 Corinthians 11:23-24, invited another elder to pray for the bread, then the ushers distributed it. I looked over to watch my wife partake and when she broke off a piece of bread, the lady sitting next to her literally stiffened up like a human exclamation point. She was frozen in place and didn’t want to look at my wife. When Becky handed the plate to her, the Witness lady moved her arm to take the plate, but she did not turn in my wife’s direction like everyone else was turning to make sure the plate wasn’t dropped. It was a bit of an awkward scene. No one behind them noticed that my wife took the bread. Both Jehovah and Jesus made a sacrifice? It reminded me of the joke where two farm animals are talking about how Thanksgiving is coming up. The turkey says to the chicken, who will be providing deviled eggs, “Thanksgiving is a donation for you, but for me it is a commitment.” John 15:13 reads in the RNWT, “No one has love greater than this, that someone should surrender his life in behalf of his friends.” Jesus died for us, but the Father didn’t. Unless you have a Trinitarian view of God, you can’t say that Jehovah loves us more than Jesus does. It was also interesting to note that the elder who prayed addressed both the Father and the Son. This has got to be the first time I have ever heard a Jehovah’s Witness pray to Jesus. This my friends is what we call blasphemy. An elder in the congregation prays to Jehovah and thanks Him for an organization that “has the sayings of everlasting life” when Peter said that specifically of Jesus and not an organization. Note also that the elder said the Watchtower has more to offer than anywhere else that people could turn. Peter didn’t say that. He asked, “Whom shall we go away to?” Not “where” or “what organization.” Lest you think this was a slip up of one imperfect man, The September 1, 1975 Watchtower said on page 531, “Where could we turn if we would leave God’s organization today? There is nowhere else! (John 6:66-69).” While the Bible clearly teaches that we need to go to Jesus for everlasting life, the Watchtower teaches that we must go to them and then uses a proof text that should only apply to Jesus. This elder only prayed what the Watchtower teaches about itself. As the wine was being distributed, the speaker again made reference to the fact that once there are none of the 144,000 left on earth, there will be no need for the Lord’s Evening Meal. This was stressed throughout the entire evening. When the wine came to my wife, she took a sip and quietly passed the cup to the still embarrassed lady sitting next to her. My wife told me afterwards that she was an elder’s wife and that she left as soon as the service was over. She didn’t even bother to say goodbye which was very strange because they were getting along fine before the meeting started. People clapped afterwards and the couple next to me noticed that I did not clap. I was busy typing notes. Another Witness read a letter from the Watchtower inviting non Witnesses to accept a bible study. After the letter they sang a closing song (# 109, Hail Jehovah’s Firstborn) then someone prayed closing the meeting. The couple next to me left without saying a word, but the man and wife in front of me introduced themselves. They were nice and glad that I visited. I looked over to where my wife was sitting and she was talking with one of the elders. My wife told me afterwards that they were questioning her about whether or not she was one of the anointed. They asked if she was from another congregation. She answered, “Yes, I go to Community Bible Church off of 1604 near 281.” I don’t think that was the answer they were looking for. My couple continued to talk to me, but I was hesitant because I thought I recognized the lady from a conversation I had with a Witness years ago. They invited me back and asked me a few question about myself. I was hoping that I could get one of the guys to come over and talk to me because I really didn’t want to talk to this lady. No one came over so I decided to ask her a question and see what would happen. I asked about Jesus celebrating the meal with his 11 faithful disciples and she told me that Jesus had already dismissed Judas because he was going to betray Jesus. I told her I wanted to see it in my Bible and started to navigate to Luke 22:21. I started to point out that the speaker stopped reading at verse 20, and then said something that I found confusing because of what verse 21 says. I agreed with him, but not verbally. Other people started coming over and introducing themselves too. One guy had a peculiar last name so I started cracking jokes. The next thing I knew, I was the life of the party. Everyone seemed so happy to meet me and they all laughed at my jokes. They laughed hard too. I asked, “How could Jesus say this if Judas wasn’t there?” I quickly joked that maybe Judas didn’t leave because he was disobedient. The small group of people laughed. The Pioneer gave an answer that I have never heard before and explained that Jesus said this because he was fulfilling a prophecy from one of the Psalms. He couldn’t remember the reference so we exchanged numbers and he promised to get back with me with an answer. I thought to myself, “You like that the fact that I think now, but I wonder how long that will last?” I also wondered how many times he has glazed over this passage himself. The small group of people laughed again and the Pioneer added “question about” as he was laughing. I thanked him and told him he was freaking me out. I’m pretty sure he is an elder because of the way people deferred to him when he came up and introduced himself. I will find out for sure later though. Wow,… your conversation was sooo lively,… I also went, but I didn’t get to talk to anyone except one.. but had my “witness” mother sitting next to me so I didn’t get to have much for conversation. In the memorial talk I attended, which was 98% the same,.. of course,.. they also read… no… quoted.. john 14:2 … house of my father has many abodes,.. (rooms)..linking it to the earthly hope and heavenly hope.. I really enjoyed your point on luke 22:21.. I cant believe I never saw that before.. interesting! I’m glad Luke 22:21 helped you. I’ve never heard a JW use John 14:2 in that context before. Could you explain his point a little more in depth? Why would Jesus provide them a place in heaven? What would they do there? Jesus had a special assignment for them. Later that evening he made a covenant with these ones who had stuck with them through their trials, a covenant for a Kingdom. One of mankind’s greatest needs is good government. Although this Kingdom government would rule over mankind on Earth, it’s throne or government headquarters would reign from heaven (Psalm 72:4,8; Daniel 7:13-14). However, Jesus would not rule all alone. Hence, he was promising his apostles a place in heaven. They were the FIRST to be chosen to start filling the the 144,000 governmental positions needed for the Kingdom to properly rule over the Earth. The job of everybody chosen to help with the heavenly governing over the Earth would be to serve as Priests and Kings over mankind on Earth (Revelation 5:10). Hope this helps to explain why John14 :2 was mentioned. Glad you could come. Yes, the Memorial service for Jesus is basically the same no matter where you attend all over the Earth. It’s because Jesus himself set the pattern of how he wanted it done, and then instructed us to keep doing it in remembrance of him. However, if you will attend our OTHER meetings, you will find a different topic discussed every meeting, which I hope you will enjoy. Thanks so much for attending! Even if your reason was for your mother, that’s a precious thing to do. You must be a good son to show her consideration in that way, knowing it meant so much to her. I have lost both my mother and father in death and would be so happy if I could have them with me now. I’ve also lost one sister and one brother. For me, since being personally affected by death, the Memorial for Jesus has taken on even greater meaning for me, as I appreciate that thanks to his sacrifice, I have the chance of being reunited with them again someday, due to the resurrection hope that we can have thanks to Jesus dying for us so that those who have died might be brought back to life again! How wonderful to be able to actually hug and hold close those loved ones now in the grave someday! (see John 5:25-30) I think of the preview from Bible resurrection accounts, especially the one where the little girl was given back to her parents after being brought back to life and they were in ecstasy with joy! Even though people like the blogger may ridicule us, it is a most sacred night for us, so we do appreciate your joining us, as we’ve worked hard to invite people, trying to make known how sacred a night this is and hoping all would come. And he does have a right to his questions, nothing should be off the table, even though he is not going about it in the kindest of ways perhaps. But that is to be EXPECTED (John 15:20). The challenge is for US Jehovah’s Witnesses in responding the right way, which can be very hard sometimes, as you can imagine, and being imperfect, many times we fail; but Romans 12:14 makes clear that we should try to bless those who persecute us, never curse them. We are reminded of the Paul, who, when he was known as Saul, was one of the most terrible persecutors of the early Christians, but he was very sincere, though sincerely wrong. He THOUGHT he was serving God. Likewise, I feel this blogger is similarly sincere and my hope is that he will KEEP asking questions until he recognizes the truth from God’s word. Whether or not that happens, it is my prayer. I hope he comes back also, and his wife, too. Last year over 19 million people attended world-wide. I hope we hit 20 million soon; that would be a great show of growing appreciation from mankind to Jesus and Jehovah. Nice. I have been in student mode with a Witness, but issues with my mother have kept me away for the past month and I couldn’t make the Memorial. Thanks for providing a good summary of what it is like for a non-Witness in attendance. I am glad to help. Thanks for reading. This was awesome! I laughed until I cried! Thank you so much for posting this!! Let us know when/if you meet with them, and ask them your questions, after all, they like people who think? Really? Since when? I got disfellowshipped for thinking!! I was surprised at the “thinking” comment too. I find it interesting that when an “interested one’s” questions become too uncomfortable, they are suddenly transformed into an opposer or apostate. Not true, from my personal experience. I questioned every little thing when I accepted the Bible Course from Jehovah’s Witnesses. They patiently put up with me for ten years of making them do research and get back to me with Biblical answers to questions before I could move on to the next topic. NO question was off the table. Of course, it wouldn’t have been proper to disrupt the meeting or the congregation with my questions in the middle of a meeting, as that is the time for upbuilding and encouragement. But, privately, every single question I ever had was answered. They also encouraged me to go to the library and compare as many Bible translations as I could find on the verses I questioned, and even consult Interlinears since I was interested in what the original languages said. It was my FORMER religions who refused to answer any questions, saying it showed a lack of faith or just saying, someday we will know, as a brush-off. Jehovah’s Witnesses NEVER treated me like that. Of course, they aren’t interested in “arguing” with people, following the Bible’s instruction of not casting your pearls before swine, and also Jesus example of choosing not to respond to his interregators at times, as when it is obvious they are not sincere, but just wanting to argue to humiliate or try to tear down the Jehovah’s Witness. But, if you have a sincere question, there is nothing that I was prevented from asking, believe me, I gave them a workout! I made them show me everything in my King James Bible, and years later, my husband insisted on using his Catholic Bible and they never ever objected to either one, during our entire Bible Course. I had a lot of questions about the disfellowshipping arrangement, and was shown the scriptures for that instruction, and it is Biblical. But it’s never for sincere QUESTIONS! I know that the elders on a judicial committee bend over backwards hoping for any sign of remorse/repentance so the person can just be reproved rather than disfellowshipped. It is really the person’s choice to be disfellowshipped if they do not want to, so to speak, abide by the house rules. But, like the Prodigal Son’s account, we don’t force them, they have free will. But, if they ever WANT to come back, they are so welcome, just as the Father in the Prodigal Son account ran to meet the returning son and kissed his neck. That is how Jehovah feels when someone returns. Before I decide to make a dedication, I questioned a former disfellowshipped one who had come back and she told me it was the best thing that ever happened to her, because the guy she was disfellowshipped over ended up in prison and if the firm stand of the congregation hadn’t made her wake up and change her ways, she thinks she may have ended up there, too. I see the wisdom in it. Now, as a parent, I understand the Biblical reasoning that Jehovah disciplines the ones he loves. I could have let my children run wild, but I disciplined them so they would grow into happy, successful, responsible, loving adults; even though it wasn’t pleasant for either them or for me at the time. In my former religion, my father-in-law openly committed adultery and he never received any counsel or discipline from the religious leader. How did that help him spiritually? And I’m grateful that my new faith does not just move people around to a different parish or congregation. My feeling is that if a fly lands in your soup, it does no good to stir it around… it’s still ruining the soup. You must remove such ones who want to ruin the peace and the refreshment for others that the safe haven of a congregation provides. watchtower leaders given their track record of dispensing doctrinal confusion over the years , and this subject of the memorial is yet another example of such behavior . Thanks for referencing that article , ” Increasing Memorial Partakers” from jwfacts.com. then we can look what they have taught about various points pertaining to the Memorial. One example is their teachings about what Jesus meant by His ” body ” in Matt 26:26 .
church : Jesus’ body members , the christian congregation . But then years later it was taught that it actually refers to His human body of flesh . [ Make Sure of All Things , p 323 ] . May Jehovah open the yes of those people who the Watchtower prophet has fooled . coming to Jesus [ Mat 11:28 ] . But, you have a right to your opinion certainly. I wish there was something I could say to change your mind, but all I can do is encourage you to keep reading your Bible with an open mind, free of all man-made traditions, or prejudices and pray for understanding. If you are sincere, Jehovah will recognize that. In the new system there will only be one religion. Satan is the one to blame for all this confusion among mankind with all the different religions. There was a time when I prayed to God saying that if he was really existed, why was he making it so hard with all the different religions? Also, why did he allow such awful things to happen, particularly kidnapped children? If he answered me those two questions, I would keep trying to follow him, but if not, I would assume he doesn’t exist and just try to be a good person. The next morning was the first time Jehovah’s Witnesses called at my door. The magazine they held up was titled: “Missing Children”. This was in 1984, and I still have it because it referred me to scriptures which helped me. Also, I asked the woman why there were so many different religions, and she referred me to 2 Corinthians 11:14-15 which was a lightbulb moment when I realized that Satan was behind all this religious confusion, not God! Since becoming a Witness myself years later, I’ve been on the other side of the door when suddenly I put something back in my bag at a door and was compelled to pull out something else and the householder expresses that they were just praying for an answer to that specific topic. I have no doubt whatsoever that God is using Jehovah’s Witnesses to help people get their spiritual questions answered. Perhaps your religion is helping you, too; but as far as fulfilling Matthew 24:14, I hope you are someday able to see that Jehovah’s Witnesses are being used by God to perform this necessary task to God’s satisfaction before the end of this system can come. I just don’t see any other religion accomplishing it to the world-wide extent and with all their members for life, the way Jehovah’s Witnesses are fulfilling this. That is only ONE reason why I hope you give them a break and not be so harsh in your feelings toward us. We’re truly TRYING, but we’re certainly FAR from perfect! Thanks for your efforts, Keith. Let us know if the pioneer really contacts you – he might be afraid after he reads the scripture for himself! If Jesus said it to FULFIL a prophecy then it must have happened as well? Surely? I wonder if you will ver hear more, Keith. You had better outcomes at the memorial than some non-JWs & seem to have been able to start some “thinking” Thanks for sharing! The answer to the video was already published in 1968 watchtower issue, Nov 15. Had Judas Iscariot left already when Jesus instituted the celebration of the Lord’s Evening Meal? Yes, the Scriptural evidence is that Judas was present for the Passover celebration with Jesus on Nisan 14, 33 C.E., but that he left before Christ instituted the memorial of his death. Of the four Gospel accounts, the only one that might lead a reader to a different conclusion is Luke’s. First, Luke mentioned the regular Passover celebration, in which Judas as a Jew would share. (Luke 22:15-18) In the next two verses, Luke 22:19, 20, he presented some of the comments Jesus made when instituting the new arrangement, the annual memorial of his death. Then Luke showed that sometime that evening Jesus indicated that one of the twelve apostles was a betrayer, which comment caused them to wonder whom he meant (Luke 22:21-23) If Luke’s presentation were accepted as being in chronological sequence, it would indicate that Judas was there when the bread and wine of the Lord’s Evening Meal were served. Let us remember, though, that even though Luke set out to present his Gospel in “logical order,” he did not always follow a strictly chronological order. (Luke 1:3) This can easily be seen from Luke 3:18-21. While this in no way limits the value of Luke’s Gospel, it being an inspired account, it becomes evident that the other Gospels should be taken into consideration to establish chronological sequence. Furthermore, Luke does not tell us precisely when Judas left the group. Surely it was before Jesus said: “You are the ones that have stuck with me in my trials.” (Luke 22:28) So let us turn to the other Gospels to determine when the betrayer left. Both Matthew and Mark explain that a questioning arose among those gathered to celebrate the passover. Jesus had indicated that one of the apostles was a betrayer, and they wanted to know his identity. Both accounts indicate that this occurred “while they were eating” the Passover meal. (Matt. 26:20-25; Mark 14:17-21) While John’s Gospel does not cover many of the points already provided in the three Gospels that were written earlier, it does mention this questioning about the betrayer. John amplifies the matter by relating that Jesus identified Judas by giving him a morsel. Then what happened? John writes of Judas: “After he received the morsel, he went out immediately.”—John 13:21-30. My gf is a JW and I’m a Christian, and I’ve been witnessing to her. After reading your blog I decided to go to the memorial also. I’ve never been to a JW event or KH before so it was an ‘interesting’ experience. I noted the speaker making a comment about we’re not allowed to be born again, and that it being up to Jehovah choosing us (to be anointed) or something. I was most definitely love bombed though! I had many many people shake my hand and even pat me on the shoulder and arm as I walked by them and the lady next to me lent me her young daughters Bible for the service. Afterwards I had 3 brothers talk to me at length and invite me to the meeting on the 27th. They also gave me their numbers to call them anytime. What I found very funny was they all made comments about how I must really know my Bible because I was flicking through it as fast if not faster than they were. lol. Keith, this is a remarkable and well-written story that makes me proud of your convictions and the willingness to act on them. You are truly a hero for those of us who grew up as JWs and left, and now want the world to be aware of Watchtower abuses that violate the basic human rights of its members and the Watchtower’s misapplication of scripture. Keep up the good work. It’s so sad to see decent people being led astray by a false prophet Jw’s are such people. paths they have confused .” NWT 1970 ed . are for His grace and for sending His Son etc, and this we do by praying to Him . ” How does Jesus’ death affect you ? Why was it the greatest demonstration of love ? who follow Him and know His Father’s will for man — Jn 5 :23 ; 6:44; 12: 26 .
normal friendship with another person consists of —- speaking, sharing with them . that is a fear the Watchtower prophet has used to control you . Jesus said to beware of false prophets — Matt 24:11 . Seek Jesus He is the way , not a organization . Praying for you to take a step and consider what Jesus offers you . When Jesus taught us how to pray, didn’t he address it to: Our Father Who Art in Heaven? He then said to pray that God’s name be sanctified/kept holy. I choose to pray to the same God that Jesus prayed to and the Father that he taught us to pray to, but I do end all prayers in Jesus name, as Jehovah’s Witnesses strongly believe what Hebrews 7:25 explains, that as our High Priest, Jesus pleads our case before God. But, as far as who the hearer of prayer is, only Jehovah is the hearer of prayer. He has delegated many things to Jesus, that is true, but the hearing of prayers he has reserved for himself alone (Proverbs 15:29, Psalm 65:2). I left my former religions to become one of Jehovah’s Witnesses because, after thorough Bible research, I came to the informed personal decision that they, although far from perfect, were much closer to teaching the truth from the Bible than any of the several Christian religions I was associated with in my past. You have a right to feel differently, but many of us also have the right to feel that Jehovah’s Witnesses teach the truth. It is not a blind, sudden decision. Even if you want it, they will not babtize you until you complete a Bible Course with MULTIPLE topics! Also, you must become an evangelizer, like Christ spread the good news of God’s Kingdom, before you can become baptized. So, it’s not something that’s entered into without Bible knowledge, to be sure. Whereas my former religions would baptize infants into their religion. I feel those who become Jehovah’s Witnesses are given much more Bible training than what I ever received in my former religions. I remember in my Grandpa’s church, he suddenly told me when I was eight years old that it was time to be babtized next Sunday, even though I hadn’t requested it and had very limited Bible knowledge, I had no choice. With Jehovah’s Witnesses, it is the person’s choice, and they won’t do it for you until they are sure it is an INFORMED choice you are making. I like that, having seen and experienced the difference. But, it is your right to disagree. I’d like to answer your question. (Even though to me it appears you only responded to Jehovah’s Witnesses invitation to humiliate them, rather than in honor of the Memorial for Jesus, I am still glad you came, no matter what your reasons). The speaker at your Memorial was correct. You must read up on the context by comparing the other Gospel accounts of the same event to understand that Judas did NOT partake of the Lord’s Evening Meal. Please see John chapter 13 makes clear that they were still celebrating the Passover meal (as indicated by dipping bread, which they didn’t do with the later unleavened bread) when Jesus dismissed Judas in verse 27. John 13:28-29 makes clear that the others present did not understand at that time why Judas left, but verse 30 clarifies that he left immediately. The other Gospel accounts make clear that the new covenant which Jesus started with the Lord’s evening meal was AFTER their Passover Meal. The Passover foreshadowed the GREATER passing over of death for mankind which Jesus accomplished with his death, thus for Christians, it would replace the Passover celebration. Although, the restrictions of who qualified to partake of the Passover meal in ancient times also foreshadowed that there would be restrictions on who could partake of the Lord’s Evening Meal (see Exodus 12:43-49). Today, 1 Corinthians 11:27 applies regarding whoever eats the loaf or drinks the cup unworthily. But, it is not for anybody, including any Jehovah’s Witness, to say whether or not you or your wife have a heavenly hope. That is a private matter between you and God; there is no way anybody else could know since we are not privvy to that private communicating between God’s spirit and the individual. We may GUESS otherwise because of your obvious wish to humiliate those gathered at a Memorial Service for Jesus, but it still is not for us to say. We do know that the early apostles had a heavenly hope and many of the early Christian disciples. But, the Bible makes clear that all the faithful ones from the Bible who died BEFORE Jesus died, will be resurrected to Earth, not to heaven. Also, it may interest you to know that well-taught Jehovah’s Witnesses realize that some of OTHER RELIGIONS will be among those who will be our rulers in heaven. After the apostasy occurred, there were many down through time who did their best to preach and teach what the Bible actually said, despite many persecutions. One of our Bible Series videos especially mentions those during the Dark Ages who were killed for trying to get the Bible out in mankind’s common language so it could be read by all. They may not have FULLY understood the truth, but people like that caught up in other religions were doing the best they could with what they understood. At one of our District Conventions a few years ago, Psalms 87:5-6 was brought to our attention that we shouldn’t worry about whether one is or is not truly a part of heavenly Zion, because these verses seem to indicate that God will reveal for sure who they are in the new system someday. It seems to indicate that we will KNOW who are leaders are. We may be surprised at the ones down through time who were selected by God to be our heavenly rulers alongside his appointed King, Christ Jesus. We were also assured that ever since the Day of Pentecost where early Christians were anointed, there has always been at least a FEW alive on Earth somewhere down through time who had a heavenly hope. But, no matter who they are, we rest assured that they will possess just the right compassion and qualities needed to fulfil their governing position for the benefit of those of us on Earth. You see, it will mean MORE than just being with Jesus, as your wife puts it, for those who have a heavenly hope. Although that’s a wonderful thing, Revelation 5:10 says they will serve as Priests for mankind on Earth, as well as rule as Kings over the Earth, alongside Christ Jesus and under his direction. The reason they go to heaven is because God has selected them to fill 144,000 specific governmental positions in the Kingdom government which will replace all mankind’ current governments (see Daniel 2:44). They will help to solve all mankind’s problems, even finally eliminating death itself. God’s original will for the Earth to be a Paradise where mankind can live forever in happiness will FINALLY be accomplished! He doesn’t look for the same qualities in a person that mankind looks for in our Earthly leaders. Compassion seems to be a common quality. There will not be ANY problem or temptation that a Christian has had to overcome that will not be represented among at least one of the anointed ones, thus their compassion and loving understanding of our shortcomings. Just as Jesus endured through a torture stake, many of those with the heavenly hope have been HEAVILY persecuted in one way or another. It is not my personal desire to go to heaven; nor is it the hope of the MAJORITY of Jehovah’s Witnesses. We simply pray for God’s will to be done on EARTH! We long to be among the meek who will inherit the Earth, as Jesus said in the Sermon on the Mount. We long to be those spoken of in Psalm 37 and Isaiah 35 and the end of Isaiah chapter 65. If others, like your wife or you, have the desire to rule over me from heaven, that is fine with me, as I know Jehovah will make the right decisions for who will be the BEST rulers. But, you must understand that it is not YOU who decides, it is GOD! But, once he has selected you, there is absolutely no doubt whatsoever, you KNOW, as God’s spirit makes SURE to make it known to you. I appreciate all those in the heavenly covenant because they will help Jesus in bringing things back to the way it was supposed to be on Earth, for Adam and Eve and their descendants. I want to enjoy family life in paradise conditions on Earth, I have no desire to die and become a spirit creature. (Those who go to heaven must be born again as a spirit creature when they are resurrected, since the Bible makes clear that flesh and blood cannot enter heaven.) I want to stay alive on Earth, but I want life on Earth to be much BETTER, with no wickedness or ageing or illness or troubles, which it will be. I hope you and your wife come again to our annual Memorial service for Jesus. But, please remember that even though it may be fun and games for you, it is a most sacred occasion for us, so please respect that. Feel free to ask any questions you want, please. Only we ask that you be sincere in wanting to know the answers so that you might understand our reasoning, NOT because you are looking for things to humiliate us for. I suggest you come to some of our OTHER meetings because that is when we have in-depth Bible study and discussion as a group; whereas as you brought out, the Memorial service for Jesus often repeats the same thing because Jesus instructed us to keep doing that in remembrance of him, fyi. You might find the other meetings more to your liking and more insightful and hopefully the next time you join us for a Memorial service for Jesus, you won’t be so irritated at the word “appreciate” being mentioned so much, as you might join us in that grateful feeling on that most sacred night, in memory of when Jesus accomplished a GREATER passover of death for the benefit of mankind, as our ransomer, when he died for our sins. P.S. When I mention Adam and Eve above, I do NOT mean to imply that they will be resurrected back to a Paradise Earth, as Adam clearly lost everlasting life. I simply was talking about what God INTENDED their life to be like… He never ever told Adam and Eve if they were extra good that would someday be taken up into heaven. No, mankind was never supposed to die, but were intended to live forever in perfect conditions on Earth, in the prime of life, eventually mankind would be one big happy family. That is STILL God’s purpose for the Earth and despite Satan’s best attempts to side-track it, God’s will WILL be done on Earth someday… soon, I hope. Sorry if my mention of Adam and Eve confused anybody on what I was trying to explain. Think of the majority not partaking like when you go to a wedding. The entire crowd doesn’t get married do they? No, most are observers as the wedding couple makes their vows. Those with a heavenly hope are illustrated in the Bible like a bride for Christ, as they will be his helpful partners in ruling over the Earth, assisting with priestly duties. We may not be the bride, but we appreciate what Jesus did for us. He died for mankind, for ALL of us, not just for the Bride of Christ. We also appreciate the great sacrifice that Jehovah made in sending his only begotten son to go through that on our behalf. Jehovah tried to help us understand by putting it in human terms with the account of Abraham being willing to sacrifice his most precious son, Isaac. And Isaac, who was about 25 at the time, willingly complied with his father’s wishes, which represents how Jesus willingly offered himself for us. When we contemplate the anguish of Abraham, we have a measure of understanding of Jehovah’s feelings–what he was willing to sacrifice out of love for each one of us. That’s another reason why the word: “appreciate” is mentioned so often at a Memorial for Jesus. It’s how mankind should feel if we meditate on what Jesus death meant for God, for him, and how it benefits each one of us if we want to take advantage of that ransom provision. Appreciation can not be over-stressed. Humiliate? Seems that those who refuse and reject the sacrament humiliate God! MOCKERY is what people do who REJECT the taking of the bread and wine. These are the symbols of Jesus’s sacrifice with clear instructions that we do this until he returns. If you refuse to partake then consider what your rejection means. A GIFT that is refused shows that you do not have respect for the GIVER. You mock God’s solution to the problem of sin. We love HIM because he first loved us NOT because we are doing the best we can After “all all our righteousnesses are as filthy rags” Isaiah 64:6 so what good is any works we try to do to impress God? Appreciation? My wife wants more than appreciation from me. She wants LOVE. It is Biblical …………… Ephesians 5:25 – “Husbands, love your wives, even as Christ also loved the church, and gave himself for it” The Bible tells us that our relationship to God is like a marriage. God simply wants our LOVE. Our pure undivided LOVE. We have a relationship with God We are no longer slaves having to work religiously for 60 hours to please God. Jesus calls ME his brother – I will live with him for ever when I die! We are sons We are heirs and as such we love to remember by partaking in the bread and wine to HONOUR His sacrifice (as per Biblical instructions). You are either in God’s family or outside. Those are the two classes – saved or lost! We have an open invitation to be either part of the family of God or to suffer eternal separation – what do YOU choose? By rejecting the symbols you reject God and choose eternal separation! We are Jesus Witnesses ‘cos that he told us to be! is but one example . Unstable —- that would describe their behavior as teachers . to and fro by their leaders — Eph 4:14 .
as a result you will get the benefits found at Jn 1:12 . Concerning the Memorial — confusion over what is meant by ” body ” in Matt 26:26 .
this was changed to include the great crowd who will live on earth . belief was changed in 1935 , now the great crowd is a earthly class . peril for following this false prophet — 2Tim 4:3,4 . In 1908 it was taught that Adam will be resurrected . in 1965 it was yes again , in 1989 it was no again . prove this ” scriptural truth” a mansion was built in San Diego for them to stay in ! of your safety when He warned about false prophets coming in the last days . first post about appreciation — especially being grateful to Jesus . publications , that you will find the simple truths that Jehovah has for you . just Jesus , for in a personal encounter with Him is how a right standing , acceptance , with the Father is commenced . Firstly, you don’t need training to read your Bible, if you can read you can do it on your own. When I became a christian there were many things in the Bible that I read and could not understand. I would pray to God and ask Him to explain it to me, and He did. He would allow me to be in situations where He then would speak through His Spirit to my spirit to understand and He would relate it to the question I had. Then I just knew that I knew the understanding of the scripture. But that means you need to have a relationship with Him, or you will never get those answers. And I think that is the biggest problem with JW’s in that they are stuffed to the brim and even overflowing with “knowledge” of the Bible, scriptures, history etc, yet I believe very few of them actually have a RELATIONSHIP with Jesus. If so, HE will personally open their eyes to the false teachings they are being fed. Knowledge is NOT going to get any of them into heaven, only a RELATIONSHIP is going to do that, and I fail to see any testimony from most JWs that indicates a relationship, rather they all try to refute arguments with misguided and mistranslated scriptures. The second I read Andrew’s post above, I could sense the love he has for the Lord, but when I read JWs’ comments the only thing I sense is arrogance (for they think they are the only ones saved since you can only be saved if you’re apparently a JW), I sense a loyalty towards an organization moreso than any loyalty to God and I sense a boasting of knowledge of scriptures (albeit sadly twisted knowledge and highly misguided). I sense everything there is to sense, BUT love for Christ, and “no one can come to the Father except through ME”. You might have the “better” argument, or the “better” scripture but without a relationship with Christ, you are no better off than any other unbeliever, and sadly I do not say that, Jesus did when he said in Matthew 7:22-23 “Many will say to me on that day, ‘Lord, Lord, did we not prophesy in your name and in your name drive out demons and in your name perform many miracles?’ Then I will tell them plainly, ‘I never knew you. Away from me, you evildoers! '” Why will Jesus say “I never KNEW you?” For there is no RELATIONSHIP!!!! Try it, and Jesus will open your eyes to the falsehood you’ve put your faith in.